Home / Manny Pacquaio versus Timothy Bradley 2 / News / Sports / Manny Pacquaio versus Timothy Bradley 2 November 2012? Manny Pacquaio versus Timothy Bradley 2 November 2012? 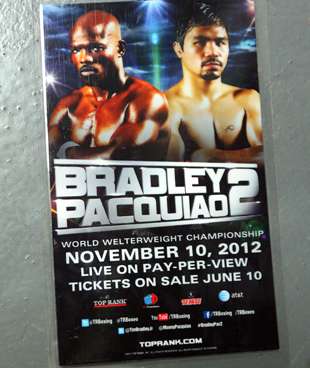 During one of the pre-fight interviews for the Manny Pacquaio versus Timothy Bradley fight of June 9, 2012 at the MGM Grand Garden Arena in Las Vegas, Nevada, Bradley showed a banner bearing the slogan Manny Pacquaio versus Timothy Bradley 2 for November 2012. With what happened during the live fight earlier, this might just happen. One of the first things I’ve thought of after the fight was my S.O. (significant other). He had been placing bets against Pacquaio since 2007. It’s not that he wasn’t a fan of Pacquaio; he just wanted to put money on Pacquaio’s ring nemesis because everyone in this country will normally root for Pacquiao. Most stakes are set not on who wins but on the basis of whether Pacquaio knocks down the enemy and in which round will he do so. My S.O. gambles on the foe instead. He wanted diversity. This fight was the first time for him not to place any bet at all. It couldn’t have been his first win if he did place a wager on Pacquiao’s adversary. Going back to the fight, obviously, most Filipinos and even boxing fans everywhere were dismayed. You’d read posts and comments in sites, blogs, and forums saying the decision was “lutong Macau.” In the local tongue, this expression meant that the other party was favored to win. Although the venue can be considered as Bradley’s hometown, Pacquiao is actually more favored between the two. Being labeled as the pound for pound king, Pacquiao is the obvious crowd favorite among boxing enthusiasts and even judges worldwide. Remember that his fights with Juan Manuel Marquez, particularly the last one were also called “lutong Macau” by Marquez fanatics, his camp, and even analysts saying that the judges favored Pacquiao. Filipinos have another reason to be disillusioned during the game. Jessica Sanchez, which the nation had adopted as its own for being half Filipina during the recently concluded American Idol 2012 sang "Star Spangled Banner, "the U.S. national anthem. I call it an LOL moment. It was the same scenario for Thia Megia (another Americal Idol Filipino contender for Season 10 in 2011) who sang the U.S. theme for the Pacquiao-Marquez 3 bout. This happens all the time. The Philippines elevates successful and popular people who have even only a drop of Filipino blood. While that can be annoying, I do believe that Pinoys just wanted to find inspiration in others and would like to take pride even from those who are not full blooded Filipinos. Between the two fighters, Bradley shows more advantages physically. He is younger, heavier, leaner, and has longer reach. He had also never suffered from a lost, whereas, Pacquiao already had 3 losses (now 4). Pacquaio is also distracted with his participation in politics and the entertainment world. Pacquaio, during one of the post interviews was quoted though for believing that he should have won the fight and he is ready for a Manny Pacquaio versus Timothy Bradley 2 November 10, 2012 rematch game. After the game, you could hear the reaction from the crowd. There were deafening and lengthy “boo!” shouts from the live audience. A lot of sports analysts and experts were also disappointed by the results. ESPN independently scored it with 119-109 in favor of Pacquiao. It was the same outcome from Harold Lederman, the unofficial judge for HBO. Most ringside media present during the event also scored it in favor of Pacquiao. The split decision result was widely criticized and was even called a corruption of the game. Pacquiao, however, was humbly gracious despite his defeat. Talking about the financial side of the game, Pacquiao brings home the bigger share from a guaranteed pay amount and pay per view anyway. The Manny Pacquaio versus Timothy Bradley 2 November 10, 2012 fight will be something we can at least look forward to. It’s more likely to happen better than a seemingly impossible Manny Pacquaio versus Floyd Mayweather match. We can be certain that Pacquiao will definitely sweat it out to prepare for the game. We may even potentially see a Pacquiao signature knockout which we were not able to see anymore in recent fights. I’m saying this because his defeat to Erik Morales back in 2005 led to 2 more rematch games where Pacquiao won via knockout against Morales. Manny Pacquaio versus Timothy Bradley 2 on November 10, 2012? Let’s just wait and see.